Rules are performance-based tasks that make predefined changes to your advertising when KPIs have met, not met, or exceeded your desired value. 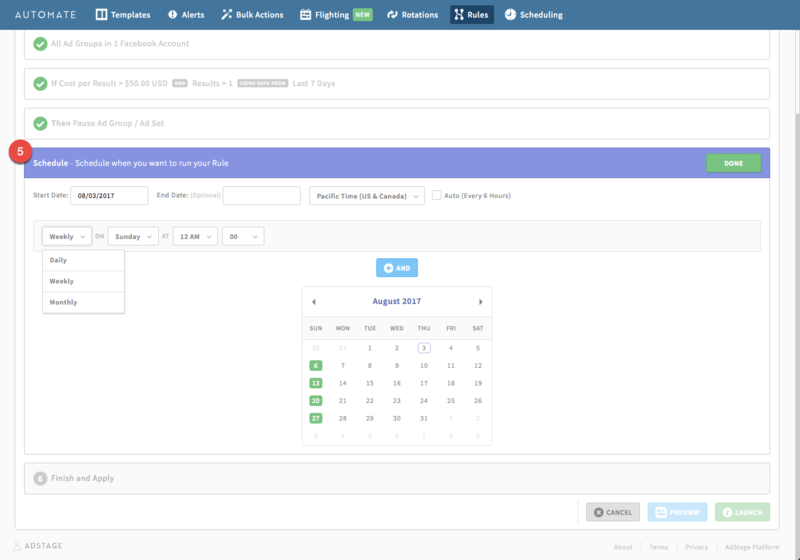 When you launch a rule (based on your scheduled start date/frequency), AdStage will look into the accounts, campaigns, etc. that your rule pertains to. 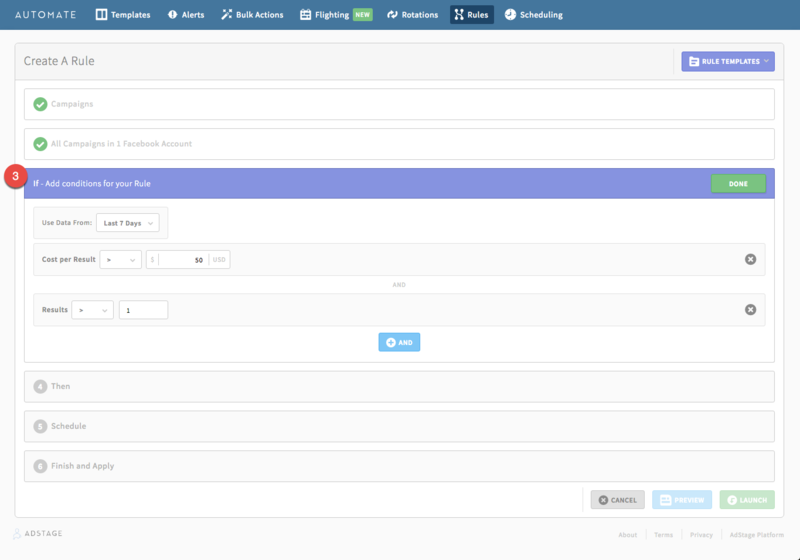 If any of the criteria you set up in your rule has been met ("If" panel), AdStage will automatically take the action you set up ("then" panel"). Options for "then" panel actions include pause, enable, increase and decrease budgets and bids. You can create rules for campaigns, ad set/group, ads, and keyword level metrics and for each, we will look at them respectively. E.g. If 5 ad groups are selected, and 1 ad group meets the performance threshold set, then it will trigger the rule and only 1 ad group will be changed to the predefined action. 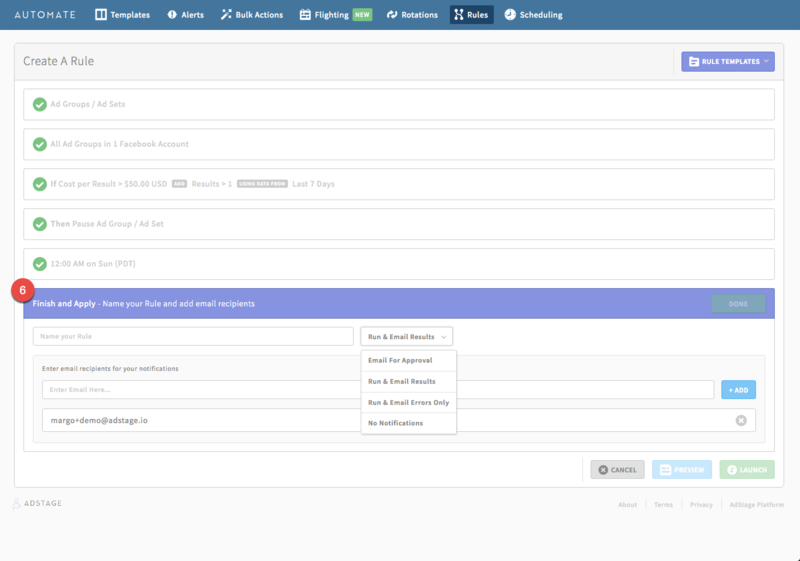 You'll have the option to request an email each time the rule runs to approve the change, as well as see the results of each rule after it runs. What are some common ways to use Rules? (1) Pause low performing ads - By taking low performing ads out of the mix, you can save money and increase ROAS, as well as keep your audience engaged. For example, if your ad spend is more than $2000, but the cost per conversion is more than $80, you can pause that ad group and allocate the money toward a better performing group. (2) Increase budget for high performing ads - On the flip side of our previous example, say you have an ad group/set that is going above and beyond to drive conversions. You can set up a rule saying something along the lines of "if ad spend is more than $500, and my cost per conversion is less than $30, increase my budget by x amount or percent. How do I set up a Rule? 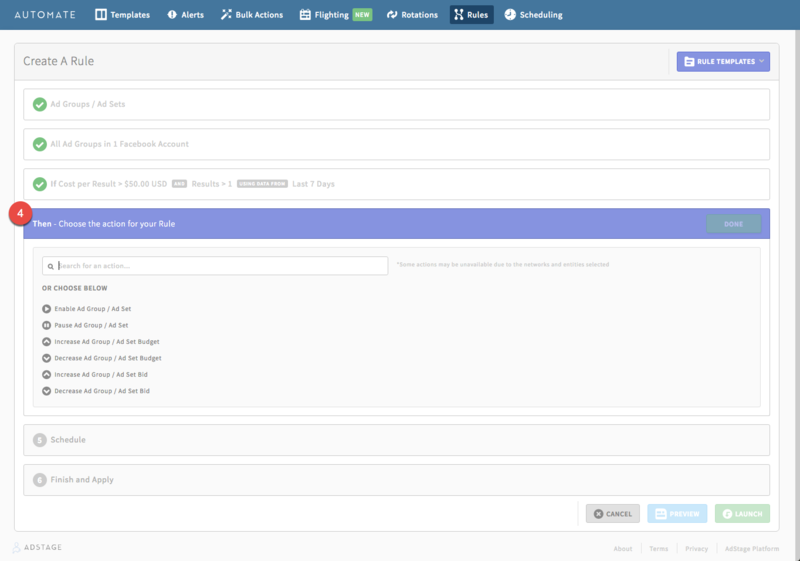 Navigate to Automate and select the Rules task. 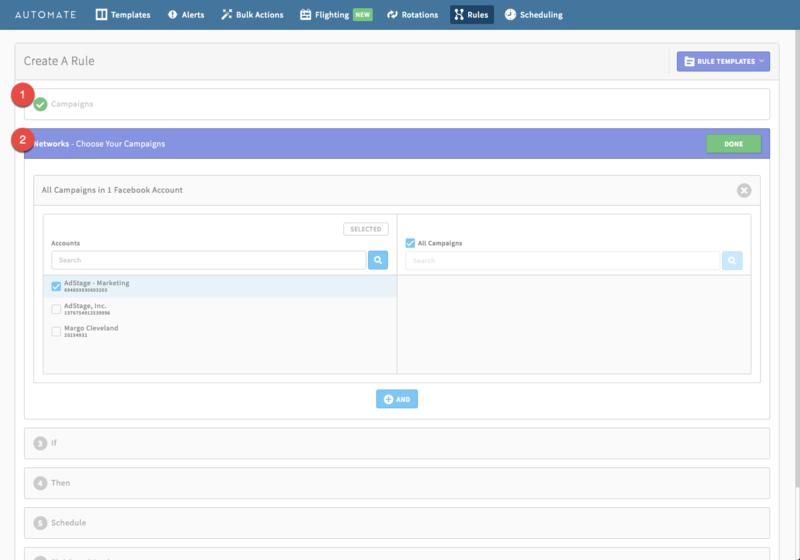 Step 1: Choose the entity level for which you want to create a rule: Accounts, Campaigns, etc. Need some help getting started? Find our most frequently used Rules to get you started under Templates.